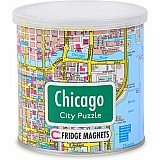 This 100 piece puzzle comes in a small canister and the pieces are magnetic. Put together the 100 piece puzzle of the solar system! Put it together on your table, or on your refrigerator, while you plan your next vacation. Puzzle size 13.4 x 9.3 inches. Can has a 3" diameter and is 3" tall. Recommended for ages : 6 to 8.